Levira purchases advanced Outside Broadcast (OB) truck to cover events in Estonia, Helsinki and Scandinavia. 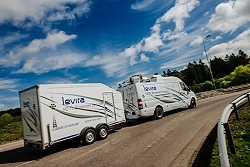 Tallinn, Estonia, April 2016: Levira has signed an agreement for construction of the largest and technically advanced outdoor broadcast vehicle in the Baltics. The double expanding 16-camera HD OB truck will enable Levira to further improve the technical quality and flexibility of its services. The truck is constructed by Lithuanian coachbuilder and system integrator company TVC, an experienced manufacturer of different types of production vehicles. Levira’s new double expanding OB vehicle has the operating capacity of up to 16 LDX80 cameras and up to four 8-channel SloMo servers. 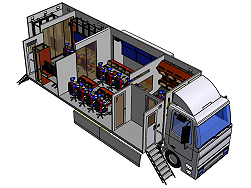 The truck shall be equipped with Ross Carbonite Black HDTV Vision mixer, Lawo Mc2 56 Mark II audio console, 5.1 Dolby Digital audio system, Imagine Platinum routing system, fully digital Riedel intercom and VSM Virtual Studio Manager for configurations. According to Head of TV Productions at Levira Kulno Kägu, the new modern OB truck is a long needed addition to Levira’s production fleet. “This cost efficient, modern and ergonomic vehicle will help us fulfil the growing needs and expectations of our clients, especially in Scandinavia,” Kägu explained. This is Levira’s third OB truck, designed mainly for medium and large productions but also suitable for low-budget projects thanks to its flexible cost-effectiveness and configuration. The truck is easily manoeuvrable and can be used in places with limited access, such as the narrow streets of Tallinn and Riga Old Towns. The first planned large productions with the new truck will be the broadcasts of KHL matches in Riga, Luge World Cup in Sigulda and EuroBasket group stage in Helsinki. In January 2018 Estonia will Estonia will assume the presidency of the European Union. “During that time there will be a lot of very complex and demanding live broadcast productions and Levira will be fully prepared for that as well,” Kägu said. New cameras, lenses, stands and other audio and video equipment have now been delivered to Tallinn. The new OB vehicle is expected to be fully operational by autumn 2016, when Levira and the constructor TVC will showcase it at the IBC, Europe’s largest professional broadcast convention taking place in September in Amsterdam.